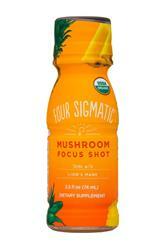 by Four Sigma Foods Inc.
Four Sigmatic, which produces a variety of mushroom and adaptogenic drink mixes, is making its way into the ready-to-drink space with the launch of Mushroom Focus Shot. Packaged in the same 2.5 oz bottle that has been the staple of the energy shot category, Four Sigmatic Mushroom Focus Shot contains a host of functional ingredients, including Lion’s mane mushrooms, rhodiola, guayusa (a natural source of caffeine), and rose hips. Pineapple juice, lime juice and salt are added for flavor, and the product also features stevia. While shots aren’t generally formulated with flavor top of mind, this product actually has a quite pleasing taste. The pineapple and lime really come through, which is a good thing both in terms of pairing well with the Lion’s mane and helping to mask the stevia. And perhaps more importantly, flavor feels right in line with Four Sigmatic’s core products. We’d say the same about the branding: despite the lack of real estate on a 2.5 oz bottle, it’s easily recognizable as a Four Sigmatic product. From there, the Mushroom Focus Shot definitely catches the eye, but the text becomes more difficult to read as you get to the lower portion of the front label or turn it around to the back. This makes it hard to read the ingredients and to see that the product has 40 mg of caffeine. So while the packaging is definitely pleasing to the eye and feels like a part of the Four Sigmatic brand, we think the brand needs to figure out a way to at least highlight the key ingredients and the caffeine content in a more prominent way -- especially if it intends to expand its shot line and/or push into retail in a single serve format. 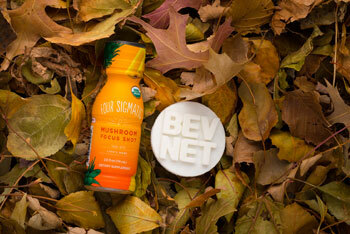 All in all, we came away as fans of Four Sigmatic’s Mushroom Focus Shot. It’s a solid debut RTD from the company and does a really nice job of staying true to what Four Sigmatic is all about.